X barks the spot in the new tour PAW Patrol Live! "The Great Pirate Adventure"! It's Pirate Day in Adventure Bay, and Mayor Goodway is getting ready for a big celebration! But first, Ryder and his team of pirate pups must rescue Cap'n Turbot from a mysterious cavern. When they do, they also discover a secret pirate treasure map! The PAW Patrol set out over land and sea to find the treasure for Mayor Goodway's celebration before Mayor Humdinger finds it first! 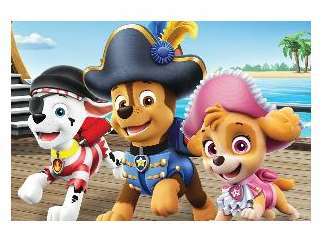 The pups will need all paws on deck for this pirate adventure, including some help from the newest pup ... Tracker!